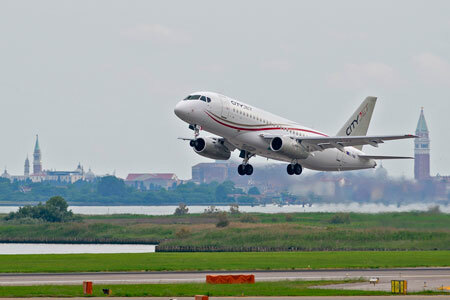 On June 2, 2016 the first CityJet Sukhoi Superjet 100 (SSJ100) soared from Venice-Marco Polo airport at 17.15 to the CityJet’s base in Dublin (Ireland). The aircraft SN95102 is the first of 15 SSJ100 ordered by CityJet. The airline is to receive 3 SSJ100 this year. CityJet is the first European customer to operate the SSJ100. The aircraft will carry 98 passengers and operate on CityJet’s short-haul network in Europe. SuperJet International will provide CityJet with the technical support through a 12-year SuperCare agreement. Moreover, CityJet crews are undergoing training at SuperJet International’s training centre in Venice (Italy).